The RESPA-TILA beast is getting closer. Don’t wait – tame it now. Get smart, get compliant, get ready. This month’s Encompass® Newsflash is packed with tips, tools and educational opportunities to help you prepare. You’ve been hearing it for months – RESPA-TILA is coming. But now it is real and right on top of us. At Ellie Mae®, we’ve been setting up on our end to help you get the education and tools you need to be ahead of this regulatory beast. Below are six ways to take steps towards readiness – our hands-on workshops, a new Resource Center, easily accessible eLearning opportunities, in-depth webinars and detailed manuals – all of it carefully compiled and curated by our team of compliance experts. Hands-On Workshops: Take the deep dive – attend one of our regional RESPA-TILA workshops. It’s real hands-on learning – not lectures – led by our by nationally recognized compliance experts. Space is limited – the first three sold out fast – so find a location and register now. It’s a deep dive into the fully functional version of Encompass 15.1 in a test environment that will allow for exploration, experimentation, and flexibility. Space is limited and filling fast – find the location nearest you and sign up right away. The New Resource Center: We just updated the Ellie Mae Resource Center. It’s easier, more comprehensive, and includes a dedicated RESPA-TILA page. Download the PDF here. And be sure to bookmark the Resource Center to easily access a range of readiness assets that can help you get dialed in. The Ellie Mae Resource Center is free for use by all users with a current maintenance agreement. If your company’s maintenance has expired, you can renew it by contacting (888) 955-9100. Please remember to go to Ellie Mae Learning/My Learning once you have clicked Register..
AllRegs® RESPA-TILA Policy Manual: The Integrated Mortgage Disclosures (RESPA-TILA) Policy Manual is a pre-written AllRegs Policy Manual. It is a complete plan – 56 pages of everything you need to articulate your company’s understanding and adherence to the rule. You can customize it to include your own internal policy, and can even personalize it match your company’s brand identity. Get yours here. Learn more about what the Title & Closing Center updates can do for you – we will present a webinar Tuesday, June 16. Sign up here, and learn what the enhancements are and how you can make the Title & Closing Center part of your RESPA-TILA compliance system. These are your tools – take advantage of them to get prepared for RESPA-TILA. We just released our Origination Insight Report for April 2015. So what does the data tell us? Purchase loans as a percentage of lenders' overall mortgage volume eclipsed 50 percent in April, according to the latest Origination Insight Report. Last month’s overall purchase share of 52 percent represented a 6 percent jump from March. The overall closing rate on all loans exceeded 65 percent for the first time since reporting began in August 2011, reaching 65.2 percent. 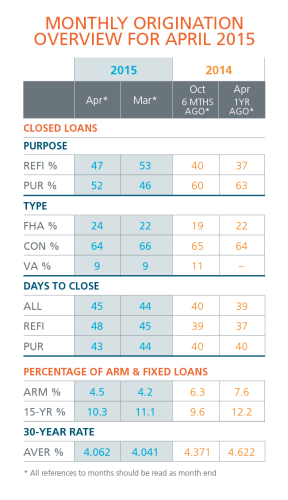 The average closing period for all loans rose from 44 to 45 days. Access the April report – and previous months’ – here. And if you want to stay right on top of the trends, be sure to subscribe and get the reports sent directly to your inbox. Just sign up on the report home page. The Origination Insight Report mines its application data from a robust sampling of approximately 66 percent of all mortgage applications that were initiated on the Encompass® all-in-one mortgage management solution. On May 16, our production rollout of the Encompass® 15.1 Release got underway. It’s a big update – geared to meet the looming demands of RESPA-TILA while elevating the all-in-one performance you expect from every aspect of Encompass. What’s New in the Encompass 15.1 Release – Watch a series of videos that provide overviews of the key features and enhancements available in the Encompass 15.1 Release. 2015 RESPA-TILA Workflow – A quick reference guide that describes the typical loan workflow required to complete documents impacted by the RESPA-TILA regulations effective August 1, 2015 and how fee data flows across the RESPA-TILA forms and tools. 2015 Itemization Fee Details Window – A quick reference guide that explains how to use the Fee Details pop-up windows provided on the 2015 Itemization input form to enter or edit detailed information about the fee. Data entered in the pop-up window is used to update the fee information on the 2015 Itemization form. Updated Encompass Field List — This document lists the input form fields used throughout Encompass. Find the Field List in the System Administration & Management of the Documentation Library. For details and the most up-to-date information, be sure to visit, bookmark and keep checking the new Ellie Mae Resource Center and its dedicated RESPA-TILA page. The self-hosted version of Encompass® is in its final phase. It’s time to make the switch over to our hosted version. It’s a simpler, smarter easier way to leverage Encompass. We know that change can be awkward, even intimidating, so we’re working to make it easy. On Tuesday, May 12, we presented a webinar overviewing the steps involved to move from self-hosted to a hosted model – and why it’s a good idea. This 60-minute webinar will help you understand the process involved, why we’re doing this, and the benefits of shifting to the ease of a hosted version. And you’ll hear from one of your peers who made the switch. Robin Harrison, Vice President and Compliance Officer from Inland Northwest Bank, will share her experience with their move from self-hosted to hosted, the business benefits they have experienced, and the efficiencies they have gained since making the move. For further information, please visit the Resource Center’s Docs Solution page. Encompass Docs Solution helps ensure quick, accurate and compliant documents from initial eDisclosures to closing documents. It automates data collection and calculations within Encompass while providing comprehensive compliance tests and audits with the Encompass Compliance Service. Long recognized as industry leaders, Ellie Mae’s compliance experts and counsel regularly collaborate with the CFPB, GSEs and mortgage investors to analyze and interpret federal, state and local regulations. The knowledge they have is essential to our – and your – success when it comes to navigating the twisting compliance landscape. And now they are taking their expertise on the road. In addition to our hands-on RESPA-TILA Workshops, Ellie Mae® and AllRegs® compliance experts will share their insights at a number of events. Mark Emanuelson, Senior Product Counsel, will serve on the OK MBA RESPA-TILA Panel, in Oklahoma City, OK on June 2, 2015. Angela Cheek, Ellie Mae’s VP & Counsel, Product Compliance, will be a part of RESPA-TILA Panel at the Hudson Cook 2015 Consumer Financial Services Conference, June 14-16, 2015. Visit the Compliance Central page on the Ellie Mae website for a complete list of speaking appearances and RESPA-TILA workshops. These are great opportunities to gain top-level knowledge from industry leaders. CondoTek’s CondoPak™ is the most efficient condo document solution for lenders that underwrite condo loans, and it is now integrated in Encompass®. CondoPak™ is the premier “lender focused” Condominium Documentation solution. It includes all of the condominium documentation needed for approval review, and helps lenders improve efficiency, consistency and quality. Each CondoPak™ includes the Certified Questionnaire, necessary Governing Documents, Current Budget and Certificates of Insurance, and more. The CondoPak™ is offered by CondoTek™, a Technology and Information firm that provides lender-focused real estate related products and services in the Condominium space with a concentration on creating efficiency for lenders when underwriting condominium loans. Three new Investor Partners have recently been added to the Encompass Product and Pricing Service™. Adding investors gives you more options to offer your borrowers, and more opportunity for you in the secondary market. For more information about Encompass Product and Pricing Service, click here. Keeping up with investors, products, and overlays takes time. But now you can find in minutes what used to take hours with AllRegs® Market Clarity®, a searchable solution for comparing up-to-date product, investor, and overlay information. Market Clarity is a business information tool that helps you quickly and efficiently manage risk, identify market opportunities and maintain a competitive edge. Combining the flexibility and reliability of a SaaS platform with a streamlined, powerful, intuitive interface and search function, Market Clarity delivers the ability to compare and contrast more than 3,000 loan products from 95 different investors. Market Clarity also lets you access detailed guidelines from investors you don’t do business with – yet. We mask their identity, and this allows you to access the information. On May 11, 2015, we announced a new partnership – one that will make Encompass® even better. Ellie Mae® is now partnered with DocuSign, Inc. (DocuSign®) to deliver advanced electronic signature capabilities to its mortgage lender clients. Ellie Mae and DocuSign will work collaboratively to integrate DocuSign’s Digital Transaction Management (DTM) platform into Encompass. This will allow you – along with more than 119,000 mortgage professionals and thousands of mortgage companies – to create an easy, efficient and secure all-digital signing process for their home-buying clients.